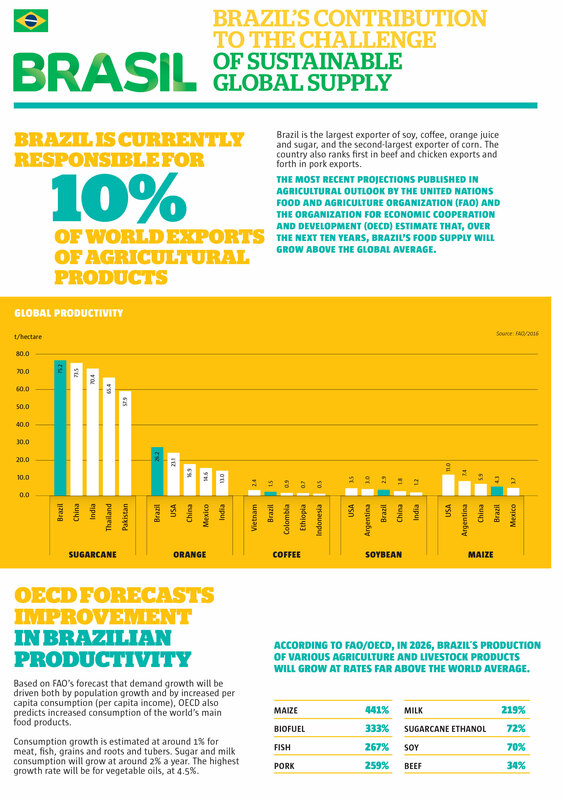 Brazil is one of the world’s leading producers and suppliers of food, fibers and agro-energy. Productivity gains obtained through technology and local farmers entrepreneurship, added to agriculture and livestock production chain organization. 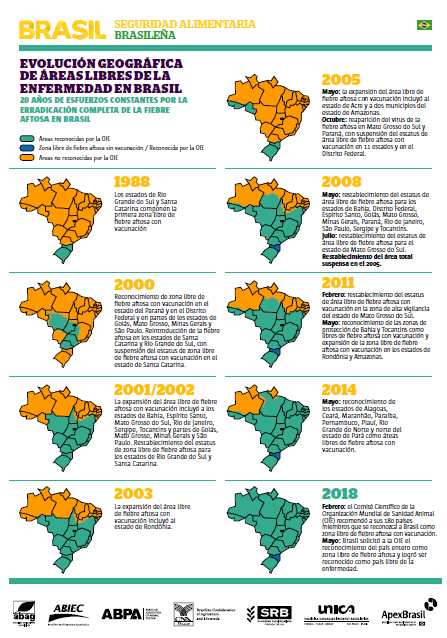 The most recent projections published in Agricultural Outlook by the United Nations Food and Agriculture Organization (FAO) and the Organization for Economic Cooperation and Development (OECD) estimate that, over the next ten years, Brazil’s production of various agricultural and livestock products will grow at rates far above the world average. Brazil also possesses extensive areas of native vegetation recognized worldwide as important to biodiversity, water cycling, carbon storage and climate regulation. Brazilian agriculture and livestock sector is ready to commit to preserving this natural resource heritage, while at the same time expanding its production and supply of essential products to attend domestic and overseas demand. Nowadays Brazil has a huge potential related to agricultural and livestock productions, but the truth is that it wasn´t always that easy! Until the mid-1970s, Brazil was not only a large food importer, but also it even received food donations from other countries. In just 4 decades, we had an incredible transformation and we evolved from being a large net food importer to the world's largest net exporter. 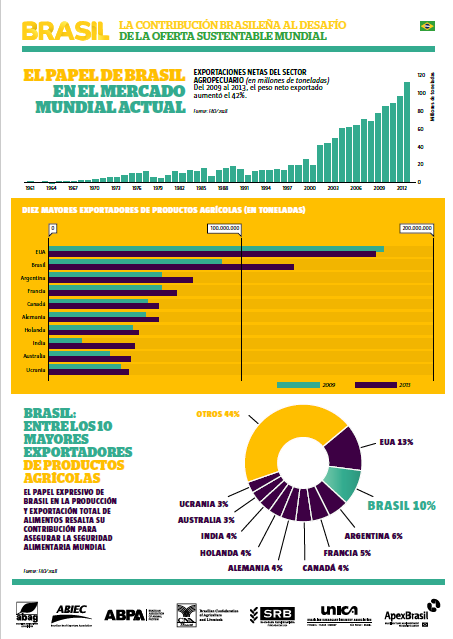 Brazil is currently responsible for 10% of the global exports of agricultural products. Today the country is the largest exporter of soy, coffee, orange juice and sugar, and also ranks in first in beef and chicken exports. The most recent projections published in agricultural outlook by the United Nations Food and Agriculture Organization (FAO) and the Organization for Economic Cooperation and Development (OECD) estimate that, over the next ten years, Brazil’s food supply will grow far above the global average. 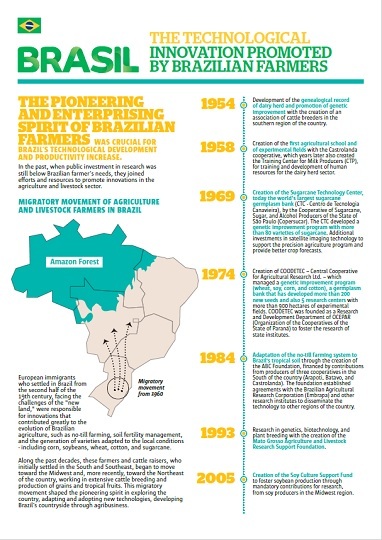 In the past, when public Investment in research was below Brazilian farmer´s needs, the pioneering and enterprising spirit of the farmers was crucial for the country´s technological development and productivity increase. They joined efforts and resources to promote innovations in the agriculture and livestock sectors. These innovations contributed greatly to the evolution of Brazilian tropical agriculture. In addition, between livestock farmers and agroindustry, a system called “integration” in both poultry and pork breeding was developed and fostered improvements in their productive chains. Brazil knows that the environmental protection is essential not only for the competitiveness in the global market, but also for the quality of life of our planet. With increasingly transparent and reliable processes, and with the support of laws and environmental policies to combat deforestation, agriculture and livestock sector is putting efforts to evolve in synchronicity with sustainability in its productive phases. 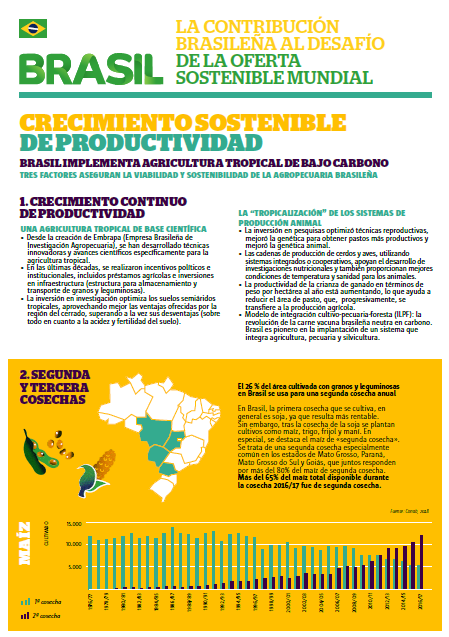 Three factors ensure the viability and sustainability of agriculture and livestock in Brazil: a progressive productivity growth due to investment in research since the creation of Embrapa (the Brazilian Agricultural Research Coorporation); the implementation of the second and third harvests each year; and also a regulatory framework for environmental protection, with policies to preserve and maintain the native vegetation of the country. 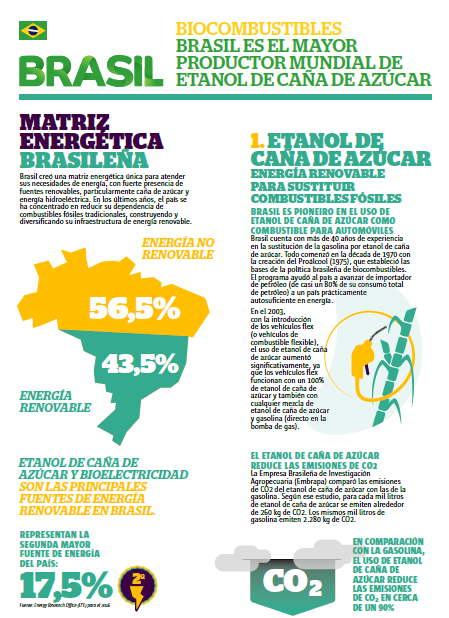 Brazil has created a unique energy matrix to meet its energy needs including a strong presence of renewable sources, particularly sugarcane ethanol and hydropower. In addition, the country pioneered the use of sugarcane ethanol as a car fuel. In comparison with gasoline, the use of sugarcane ethanol reduces about 90% of CO2 emissions. 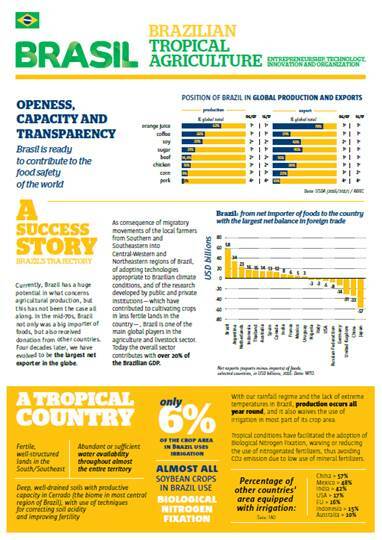 Sanity control of Brazilian livestock is universalized and affects all regions of the country. Brazil keeps a high standard of veterinary services, internationally acknowledged by the World Organization for Animal Health (OIE). 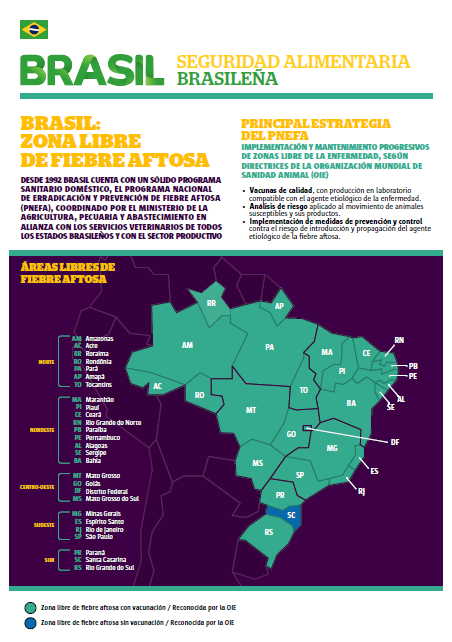 Brazil was certified a foot-and-mouth disease-free-zone on May 2018 at the 86th General Session of the World Assembly of National Delegates of the OIE (World Organization for Animal Health). It took 25 years of constant efforts to completely eradicate foot-and-mouth disease in the country.